Above: View in Exchange Court looking south to the Strand. Exchange Court is one of the last remaining alleyways in the Strand area. It is a pedestrian turning off the north side of the Strand that leads up to Maiden Lane. 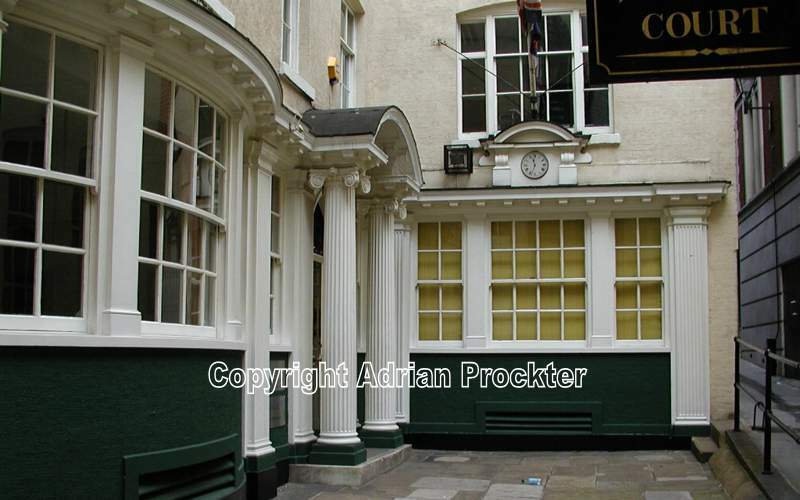 Exchange Court is named after the unusual 18th century row of shops in the Strand called ‘New Exchange’. 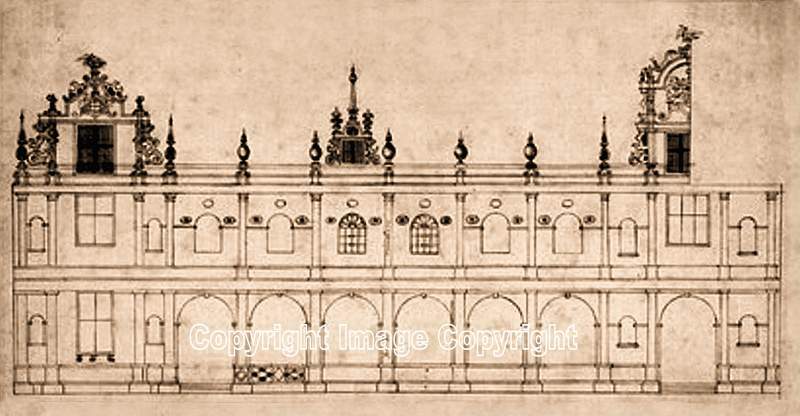 Above: One of very few drawings of the frontage of the New Exchange. The ‘New Exchange’ was built on the south side of the Strand, on the site of the old stables of Durham House, directly opposite today’s Bedford Street. Its frontage extended from George Court to Durham Street (or from 52 to 64 Strand). It was an elegant building. According to the historian Strype, the New Exchange was ‘furnished with shops on both sides for milliners, seamstresses and other trades that furnish dresses’. The account adds it ‘is a place of great resort and trade for the nobility and gentry, and such as have occasion for such commodities’. The first stone was laid 10 June 1608. It enjoyed great popularity for just over 100 years when it went into decline after the death of Queen Anne (1714). It was taken down in 1737 and a ‘New Exchange Court’, almost opposite the original site on the north side of the Strand, was named after the building. Because ‘New’ in the name of the alleyway would have begun to sound a little strange with the passage of time, the name has been shortened to ‘Exchange Court’. Above: Premises that were once used by the Corps of Commissionaires, now converted into apartments. The most distinguished building in Exchange Court is the old premises of the Corps of Commissionaires, which has a rather elegant ground floor exterior. The organisation was started in1859 by Captain Edward Walter, a soldier himself and proprietor of the ‘Times Newspaper’, as part time employment for the many old soldiers who found it hard to get a job after returning from the Crimean War. It is the oldest security company in the world. In the 1960s the men acted as doormen for banks and other large companies, wearing a distinctive dark blue uniform. For many years the Corps of Commissionaires occupied the building on the west side of Exchange Court. The organisation is still going strong but in 2008 the name was changed to ‘Corps Security’. Her Majesty Queen Elizabeth II is the head of the company today. There are offices all over England and the London offices are now located in Market House, 85 Cowcross Street, in the City of London. Men working in the organisation are recruited from ex-servicemen. The company has become the UK’s most established and respected specialist security services provider. The old building in Exchange Court has been converted as a block of apartments selling for around £1 million. Anyone living there is certainly in a central position for working in the West End as well as living very close to all the theatres and other entertainments in the area. 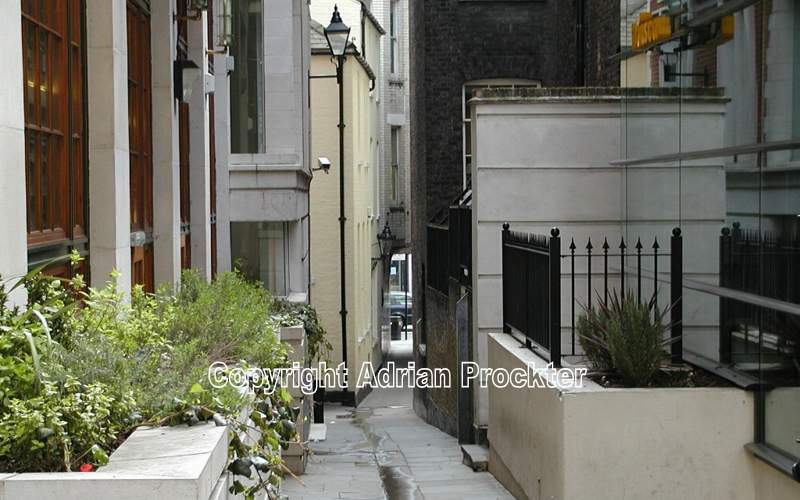 To walk along a narrow passageway like this one is to take a journey back in time when, before large office blocks lined the Strand and caused the obliteration of the many ancient alleyways, the area had many similar short-cuts. This entry was posted in /Wes-Strand. Bookmark the permalink.